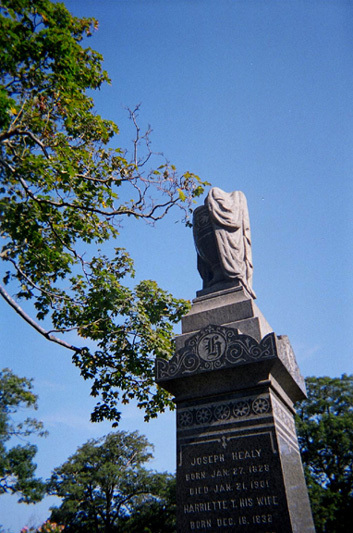 Oak Grove Cemetery in Fall River is a very special place, and a fine example of the Victorian memorial park ideal inspired by the first American garden memorial park, Mount Auburn. It is filled to the brim with symbolism of the age, and is the final resting place of many celebrated and important city personalities from inventors, to artists, to politicians, actors and humanitarians. For historians and researchers, a visit to the graves of Fall River’s famous ancestors is as close as one can come to meeting those people of long ago. In every city cemetery lay the history of that city. It is important to remember our citizens of the Past, and vitally important to keep this sacred ground preserved and well-maintained for future generations. * Note This site is not affliliated with the F.O.G. (Friends of Oak Grove) Society which sponsors tree-planting and other projects in the cemetery. I am so impressed. I am a living history reenactor with a passion for Victorian Cemetery. I enjoy this site immensely. Please send me more information of the friends of Oak Grove. I am trying to find my grandmothers grave. I went to it a couple of times and am pretty sure that it Oak Grove. I was young. It was at the end of a street and we went in and took a left to the grave then a right. My grandmother’s name was Laura B. Hawes she died on 10-18-1966. I would just like to go and put flowers on her grave. My parents are bother deceased so I can’t ask them. I spent much of my childhood and teen years living in Fall River. I have relatives that work in Oak Grove Cemetary and also family that live in the area. Needless to say I have spent much of my time walking through the cemetary and appreciation both it’s beauty and obvious history. I am currently attending BCC and my professor has assigned an out of class learning experiace for which I will have to write an essay on. Your page is wounderful I can not seem to find much historical information about the cemetary (founder, year it began, ect). I was woundering if anyone would be able to provide any information regarding this matter or direct me to an individual who could. Any help would be truely appreciated. My great aunt was allegedly murdered by her wealthy powerful husband in 1901 in Lake Mills, WI. He then (allegedly) bribed a local doctor to cover it up and that was the end of it, until a few months ago when I stumbled upon this old legend. Last week, I had my great aunt’s body exhumed, so that we could find out what happened to her. During the exhumation, there were many more odd discoveries, and I’m writing to find out who could answer some basic 1901-funeral etiquette questions? Send your questions to Revdma@aol.com– we will get answers!